According to the United Nations (UN), 18,000 homes in Gaza were destroyed or severely damaged during last summer's war. More than 120,000 suffered minor damage. One year on from the end of the war, 108,000 people — more than five percent of the strip's population — remain homeless and not a single destroyed home has yet been rebuilt. While the Gaza Reconstruction Mechanism — a UN-brokered agreement aimed at enabling building materials needed for reconstruction to be brought from Israel into Gaza — has increased the amount of building materials entering the strip, much of it has been earmarked for Qatari road building projects, and in total it still only equates to five percent of need. Further slowing progress is the massive shortfall in the $3.5 billion in donations pledged by the international community to help rebuild Gaza. Only around27 percent had actually reached the strip by mid-April, according to the International Monetary Fund. According to Oxfam, if reconstruction continues at this pace it could take "more than century" to repair the damage to Gaza's hospitals, schools and homes. 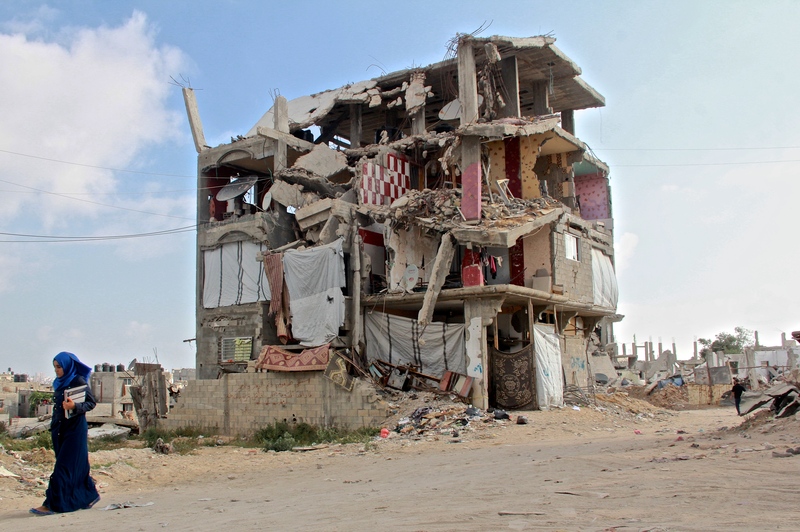 One year on from the war, hundreds of Gaza's poorest are still living in makeshift accommodation. In Khuzaa, a town nestling the Gaza-Israel border and the scene of the ferocious fighting, scores of families still live in metal containers without electricity or running water. In the winter temperatures sink to below zero while in summer they can soar to above 100 degrees Fahrenheit, posing a major health risk for the young and elderly. Last winter one four month old baby died after suffering complications resulting from the cold and damp living conditions in the caravans. Many of families living here depend entirely on international aid and other charitable donations. Most cooking is done outside on fuel stoves. A report released Monday by Save the Children found that nearly 12 months after the end of the war around 70 precent of children in Gaza had regular nightmares, and three quarters suffer from bedwetting. Nearly 90 percent of parents said their children had "consistent feelings of fear." In total 551 children were killed during the bombing of Gaza, and an estimated 1,500 were orphaned. A further 3,436 were injured, of which 10 percent now suffer a permanent disability. "Many children in Gaza have now lived through three wars in the past seven years, the last one notable for its brutality. They are emotionally and, in some cases, physically shattered," Save the Children's Chief Executive Justin Forsyth said in a statement. Being a fisherman was once one of Gaza's most lucrative professions, but now the trade struggles to bring home a profit. Since Hamas took control of the strip in 2006 Israel has limited the distance boats can travel to six nautical miles from the coast, essentially cutting off their access to deeper sea areas where more profitable catches such as tuna and sea bream are found. Fishermen who stray beyond the limits are seen as a security threat and are routinely shot at by Israeli navy ships patrolling the shore. In March, 32-year-old Tawfiq Abu Riyala was shot dead while making improvements to an artificial reef he had built to attract better fish closer to shore. The men pictured above say their financial situation was made worse during the war after Israeli strikes destroyed warehouses at the port where much of their equipment was stored, leaving them dependent on hiring gear or borrowing money to replace it. Mahmoud Barawi poses for a picture before his wedding. His wife-to-be lost 22 members of her family during the war and Barawi's home was destroyed. The couple's wedding is one of 200 marriages being financed by a United Arab Emirates charitable organization offering support to Gazans badly affected by the war. 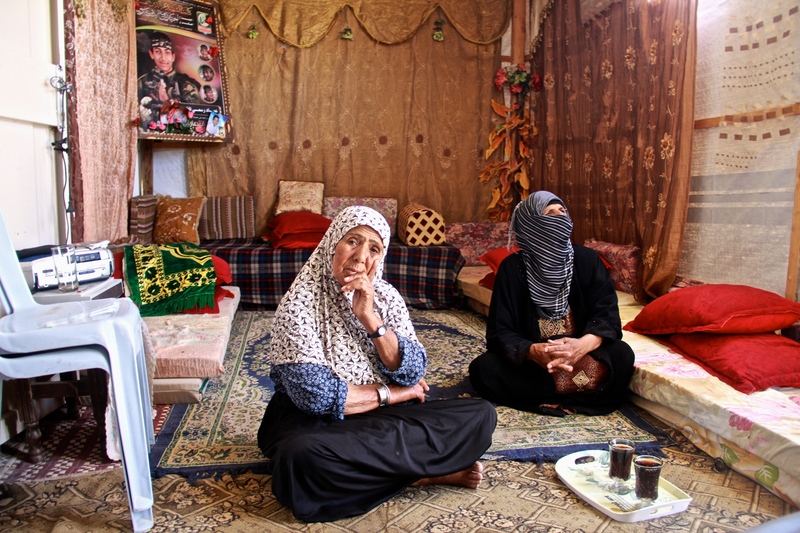 "We had nothing no money, no hope, so when we found out that we could be marry it was like a dream, finally something good was happening," Barawi told VICE News. In March the World Bank declared Gaza's economy was on "the verge of collapse." Since the end of the war unemployment has risen eleven points to 43 percent, the highest rate of joblessness in the world. Youth unemployment is even greater at around 60 percent. Due to funding shortfalls and rifts between Hamas and the Palestinian Authority in the West Bank, many civil servants in Gaza have not been paid for months. According to the World Bank report, destroyed infrastructure, faltering reconstruction, and intensified restrictions by Israel and Egypt on the movement of goods across their borders with Gaza have also prevented post-war economic recovery in the strip. 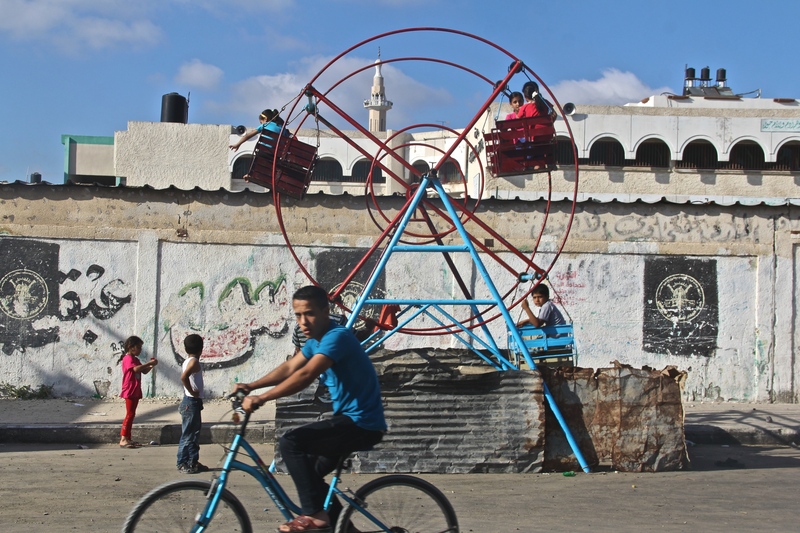 "The economy cannot survive without being connected to the outside world," Steen Lau Jorgensen, the World Bank's country director for the West Bank and Gaza said in a statement. Research by the World Bank has found nearly 40 percent of Gaza's 1.8 million population are living in poverty and around 80 percent depend on international humanitarian aid. Currently around 95,000 people in the strip suffer food insecurity and struggle to get enough nutrients to live a healthy and happy life, according to the UN's World Food Program. The international body's Office for Coordination of Humanitarian Affairs has said that pregnant women and young children are especially at risk of health complications caused by a lack of dietary diversity. With little money to afford food or staff, Gaza's zoos are in dire economic straits. Hundreds of exotic animals including tigers, tortoises, emus and porcupines have been killed in Israeli military offensives in Gaza during the three conflicts in the last seven years. Others have died from trauma, disease and starvation during and after fighting. During the last conflict the zoo owner's son was badly injured after his leg was hit by half a dozen pieces of shrapnel while trying to feed the animals under fire. The lion cub pictured above was rescued and taken to Jordan last Sunday by Four Paws, a international animal rights group. The organization says it will continue to support Gaza to improve the terrible conditions in its zoos, where most animals are kept in cramped enclosures. Four Paws has also offered to give the 19-year-old son of Saad al-Jamal, the man in the picture, a training course in caring for big cats at one of their specialist centers in recognition of his love for the two cubs. In the first five months of this year the Rafah border crossing into Egypt was only open for departures on five days, allowing just 2,500 Palestinians to exit Gaza. As relations improved between Hamas and Egypt's army-backed government, the crossing was opened for eight days in June, but after attacks by an Islamic State-affiliate in the Sinai peninsula last week, it was closed again. It is unclear when it will re-open. More than 15,000 Palestinians are registered to leave Gaza via the Egyptian border. In February, elusive graffiti artist Banksy took his politically-charged spray cans to Gaza and painted three murals amid the strip's ruins: a kitten playing with a ball of wire constructed from the rubble, a weeping Greek goddess on a shrapnel-damaged door, and children swinging from an Israeli watchtower. In a video posted online about the artwork, Banksy called on viewers to "make this the year you discover a new destination... well away from the tourist track" where "locals never leave... because they're not allowed to." In explanation of the kitten picture, the graffiti artist said: "I wanted to highlight the destruction of Gaza but on the internet people only look at pictures of kittens." This is not the first time Banksy has painted in support of Palestinians. His work also features on walls in the West Bank.